Not to be confused with Christopher Pyne or Chris Pyne. Pine was born at Cedars Sinai Hospital in Los Angeles, California. His father, Robert Pine, is an actor who co-starred on CHiPs as Sergeant Joseph Getraer, and his mother, Gwynne Gilford, is a former actress who became a practicing psychotherapist. He has an older sister, Katie. His maternal grandmother, Anne Gwynne, was a Hollywood actress, and his maternal grandfather, Max M. Gilford, was an attorney who was elected president of the Hollywood Bar Association. Pine's maternal grandfather was from a Russian-Jewish family. Pine graduated from the University of California, Berkeley in 2002 with a B.A. in English. When he got to Berkeley, Pine was initially scared of looking for a place to fit in and had a hard time making friends. As he was not interested in joining a fraternity, he got into theater. As a member of the UC Berkeley Theater Department, Pine performed in a Caryl Churchill play in La Val's Pizza's Subterranean Theater and performed Orestes and Shakespeare at Zellerbach Hall. He was an exchange student at the University of Leeds in England for one year. After graduating from Berkeley, he attended the Williamstown Theatre Festival, and he studied at the American Conservatory Theater in San Francisco. Pine's first acting role was in a 2003 episode of ER; the same year, he also appeared in episodes of The Guardian and CSI: Miami. In 2004, he appeared in Why Germany?, a short film; and in The Princess Diaries 2: Royal Engagement. Pine played the part of Nicholas Devereaux, the love interest of Anne Hathaway's leading character. In 2005, Pine appeared in an episode of the series Six Feet Under, as well as in Confession, an independent film that was released directly to video, and The Bulls, another short film. Pine appeared in the made-for-television film Surrender, Dorothy which aired in early 2006. He played Jake Hardin in the American film Just My Luck, a romantic comedy in which he starred opposite Lindsay Lohan, who played Ashley Albright. The film was released on May 12, 2006. Later that year, Pine appeared in the comedy Blind Dating, and in the action film Smokin' Aces. Pine did the one-man play The Atheist, at Center Stage, New York, in late 2006. In 2007, he starred opposite Scott Wolf in the Los Angeles production of Neil LaBute's play Fat Pig, winning positive reviews for his depiction of a competitive, alpha-male friend. He portrayed real-life Napa Valley vintner Bo Barrett in the 2008 film Bottle Shock. In 2007, Pine turned down a role in a film adaptation of White Jazz, to accept the part of James T. Kirk in the 2009 Star Trek film, which was released to critical and viewer acclaim in May of that year. That same month, he made a brief appearance promoting the film on Saturday Night Live, with co-stars Zachary Quinto and Leonard Nimoy. During the rest of the summer of 2009, he appeared in the Los Angeles production of the Beau Willimon play Farragut North. Pine appeared in the Los Angeles production of The Lieutenant of Inishmore during the summer of 2010, for which he won the Los Angeles Drama Critics Circle's lead appearance award. In the fall of 2009, Pine began filming the action film Unstoppable, directed by Tony Scott and written by Mark Bomback, which was released in November 2010. In the film, he played a young train conductor who helped a veteran railroad engineer (Denzel Washington) stop an unmanned, half mile long runaway freight train carrying toxic liquids and poisonous gases from wiping out a nearby city. The Hollywood Reporter named Pine as one of the young male actors who are "pushing—or being pushed" into taking over Hollywood as the new "A-List". In 2011, Pine sat down with the actor who originated the role of Captain Kirk more than forty years earlier, William Shatner, for the feature length documentary The Captains, which Shatner wrote and directed. The film sees Shatner interview Pine about his career and how it felt to take the role of Kirk for the 2009 movie. Their interview features a scene where the pair arm wrestles; pictures of this incident "went viral" leading to Internet headlines such as "Kirk v. Kirk" and others. Pine filmed the romantic comedy This Means War, with Reese Witherspoon and Tom Hardy, during the fall of 2010, in Vancouver. This Means War was released in February 2012. Pine voiced the character of Jack Frost in Rise of the Guardians. Pine co-starred with Elizabeth Banks, Olivia Wilde and Michelle Pfeiffer in the family drama People Like Us, which was filmed in early 2011 and released in June 2012. He reprised the role of Captain Kirk in the sequel to 2009's Star Trek, Star Trek Into Darkness, released in the US on May 15, 2013. In 2009, Pine entered talks to play CIA analyst Jack Ryan in a reboot of Tom Clancy's novels. He starred in Jack Ryan: Shadow Recruit, which was released in 2014. Pine was the fourth actor to play the character, after Alec Baldwin, Harrison Ford, and Ben Affleck. In 2014, Pine was in talks to star in a thriller about the United States Coast Guard, The Finest Hours, released in January 2016. He guest-starred in Netflix's Wet Hot American Summer: First Day of Camp and lent his voice for SuperMansion in 2015. In May 2015, Pine was confirmed to play one of the Howard brothers, along with Ben Foster, in Hell or High Water (originally called Comancheria). Filming started on May 26, 2015 in New Mexico. The film premiered at the 69th annual Cannes Film Festival in May 2016 and was released in August 2016. He reprised the role of Captain Kirk in Star Trek Beyond. Filming began in June 2015 in Canada, and it was released in the US on July 22, 2016. On July 14, 2016, he received his first Emmy Award nomination in "Outstanding Character Voice-Over Performance" for his work on the series SuperMansion. Pine was invited by Barbra Streisand to duet with her on her album, Encore: Movie Partners Sing Broadway, along with other stars. In 2015, Pine was cast as Steve Trevor, opposite Gal Gadot, in the superhero film Wonder Woman, which was released in June 2017. Also in 2017, he reprised his roles in SuperMansion season 2 and Wet Hot American Summer: Ten Years Later, guest-starred in Angie Tribeca season 3 (including an episode where his father was also a guest star), and narrated the final episode of National Geographic Channel's Breakthrough season 2. In 2018, Pine played Dr. Alexander Murry in the fantasy film A Wrinkle in Time, based on the novel of the same name. In April 2017, Pine was cast as Robert the Bruce in Outlaw King. The filming started on August 21, 2017 in Scotland and the film was released on Netflix on 9 November 2018. In May 2017, Pine was in negotiations to star in a film adaptation of the novel, All the Old Knives, opposite Michelle Williams. In July 2017, the US cable network TNT announced Pine would play the role of Jay Singletary in a six-episode television drama, One Day She'll Darken, and serve as an executive producer alongside director Patty Jenkins and writer Sam Sheridan. The show, now renamed I Am the Night, would air in January 2019. Zachary Quinto announced an untitled fourth Star Trek film was still in the early stages of being written in July. On September 5, 2017, it was announced that Pine is set to star as Robert F. Kennedy in a limited series on Hulu, produced by Sony Pictures Television. He will also serve as an executive producer for the series, based on the Larry Tye biography Bobby Kennedy: The Making Of A Liberal Icon. On June 13, 2018, director Patty Jenkins announced through Twitter that Pine will appear in the Wonder Woman sequel Wonder Woman 1984 as Steve Trevor. In August 2018, it was reported that Pine would not be reprising his role as Captain Kirk in the fourth film of the Star Trek film series after contract negotiations fell through. Pine voiced a version of Peter Parker / Spider-Man in Spider-Man: Into the Spider-Verse. Pine has stated, "I definitely have a spiritual outlook... I am not a religious guy, I am probably agnostic." On March 1, 2014, while filming Z for Zachariah in New Zealand, Pine was arrested by police near Methven after failing to pass a routine roadside breath alcohol test. He pleaded guilty to drunk driving on March 17, stating that he drank four vodkas at a local pub. Pine was disqualified from driving in New Zealand for six months and ordered to pay NZ$93 in reparation. He had a clean record, and the judge said that "the incident was out of character." Politically, Pine has called himself a "left-leaning liberal." He has stated that both Democrats and Republicans tend to be interchangeable when it comes to certain actions, citing President Obama's strengthening of the Patriot Act. During the 2016 presidential campaign, Pine along with fellow Star Trek coworkers J.J. Abrams, John Cho, Simon Pegg, Zachary Quinto, Zoe Saldana, Karl Urban, George Takei, Justin Lin, Bryan Fuller, and Adam Nimoy, endorsed a movement called Trek Against Trump. The movement endorsed Hillary Clinton. On November 1, 2016, Pine, along with director Joss Whedon, released a video urging people to vote in the upcoming elections. While the video was a parody of Congress in general, certain commentators took the video to represent the Republican Congress. In Batman v Superman: Dawn of Justice, Pine appeared in a photo cameo. 2003 ER Levine Episode: "A Thousand Cranes"
The Guardian Lonnie Grandy Episode: "Hazel Park"
CSI: Miami Tommy Chandler Episode: "Extreme"
2004 American Dreams Joey Tremain Episode: "Tidings of Comfort and Joy"
2005 Six Feet Under Young Sam Hoviak Episode: "Dancing for Me"
2009 Saturday Night Live Himself Episode: "Justin Timberlake/Ciara"
"Episode: Power to the People"
^ "Monitor". Entertainment Weekly (1274). August 30, 2013. p. 20. ^ "Chris Pine: Film Actor, Television Actor, Actor (1980–)". Biography.com (FYI / A&E Networks). Retrieved July 27, 2017. ^ Turbiville, Tom (February 7, 2010). "Aggie connections move actor to help Bryan school". theeagle.com. Retrieved July 19, 2010. ^ Chiu, Alexis; Huver, Scott (May 25, 2009). "Star Trek's Hot New Hero Chris Pine". People.com. Retrieved July 19, 2010. ^ a b c Martin, Denise. "10 things you didn't know about Chris Pine". Los Angeles Times. Retrieved July 19, 2010. ^ "Jews Making News: Seth Meyers Takes Over Late Night". Atlanta Jewish Times. February 26, 2014. Retrieved March 8, 2018. ^ Smith, Krista (May 2009). "To Boldly Star". Vanity Fair. Retrieved July 19, 2010. ^ "Chris Pine biography". TV Guide. Retrieved July 19, 2010. ^ "Chris Pine, the Next Action Hero". Men's Journal. Retrieved November 12, 2017. ^ "Search Results artistic : UC Berkeley Department of Theater, Dance, and Performance Studies". tdps.berkeley.edu. Retrieved October 20, 2017. ^ "Chris's new role is light years from Leeds digs". Yorkshire Post. May 1, 2009. Retrieved July 19, 2010. ^ "'Awards Chatter' Podcast — Chris Pine ('Hell or High Water')". The Hollywood Reporter. Retrieved February 15, 2017. ^ "The King's Stag". Williamstown Theatre Festival. ^ Robinson, Paul (April 23, 2009). "Actor's Yorkshire days recalled as new Star Trek film hits the screens". Yorkshire Evening Post. Retrieved July 19, 2010. ^ Torre, Nestor (May 15, 2009). "Star Trek launches Chris Pine to stardom". Philippine Daily Inquirer. Archived from the original on May 19, 2009. Retrieved July 19, 2010. ^ "Chris Pine Covers Out: 'Star Trek Into Darkness' Star Dishes On Gay Roles, Love Scenes". Huffington Post. May 6, 2013. Retrieved February 15, 2017. ^ "In 'Just My Luck,' Lindsay Lohan Is a Career Girl Hunting Love". New York Times. May 12, 2006. Retrieved February 15, 2017. ^ "Sometimes Pulp Fiction Emphasizes Pulp Over Fiction". New York Times. January 26, 2007. Retrieved February 15, 2017. ^ "A Reporter's Machiavellian Side". New York Times. November 30, 2006. Retrieved February 15, 2017. ^ "Hollywood's Chris Pine Stars in Off-Broadway's Atheist Starting Nov. 24". PlayBall. October 10, 2006. Retrieved February 15, 2017. ^ "Bottle Shock". The Hollywood Reporter. January 28, 2008. Retrieved February 15, 2017. ^ Carnahan, Joe (October 22, 2007). "Clooney Drops Out of White Jazz, Too". ComingSoon.net. Retrieved July 19, 2010. ^ "Chris Pine was once "scared" to play Capt. Kirk". Access Hollywood. April 3, 2009. Retrieved July 19, 2010. ^ Boucher, Geoff (May 7, 2009). "As Kirk, Chris Pine boldly goes where we've been before". chron.com. Retrieved July 19, 2010. ^ "Star Trek stars beam up to SNL". Access Hollywood. May 10, 2009. Retrieved July 19, 2010. ^ McNulty, Charles (June 25, 2009). "Review: Farragut North at the Geffen Playhouse". Los Angeles Times. Retrieved September 19, 2009. ^ Reiner, Jay (July 13, 2010). "Review: The Lieutenant of Inishmore a gruesome pleasure". Reuters. Retrieved August 2, 2010. ^ "Chris Pine, Ed Harris Win L.A. Drama Critics Circle Theater Awards". The Hollywood Reporter. March 15, 2011. Retrieved January 28, 2014. ^ Ditzian, Eric (June 4, 2009). "Exclusive: Chris Pine In Talks To Join Denzel Washington For Unstoppable". MTV. Retrieved July 19, 2010. ^ Blank, Emily; Schutte, Lauren (November 15, 2010). "Hollywood's A-List Redefined". The Hollywood Reporter. Retrieved June 26, 2012. ^ "Exclusive Clips from William Shatner's 'The Captains'". Trekmovie.com. July 18, 2011. ^ Claggett, Bruce (September 12, 2010). "Film starring Reese Witherspoon to be shot in Vancouver". NEWS1130. Archived from the original on March 23, 2012. Retrieved September 20, 2010. ^ Abrams, Rachel (April 11, 2011). "Fox dates 'Chronicle,' 'This Means War'". Variety.com. Retrieved April 12, 2011. ^ Swayne, Valerie (July 6, 2012). "'Rise of the Guardians' Trailer Delves Into Jack Frost's Backstory". hollywoodreporter.com. Retrieved April 15, 2015. ^ Breznican, Anthony (January 10, 2011). "EXCLUSIVE: Michelle Pfeiffer cast as Chris Pine's mom in 'Welcome to People'". Entertainment Weekly. Retrieved January 28, 2011. ^ Hepburn, Ned. (November 24, 2011) 'Star Trek' Sequel To Open May 17th, 2013 Archived November 27, 2011, at the Wayback Machine, Blackbookmag.com; retrieved June 24, 2012. ^ Leins, Jeff (October 13, 2009). "Chris Pine in Talks to Play the New Jack Ryan". News in Film. Retrieved October 17, 2009. ^ "Chris Pine in Talks to Play Jack Ryan". ComingSoon.net. October 14, 2009. Retrieved July 19, 2010. ^ "Chris Pine in Talks to Star in Disney Coast Guard Drama". The Hollywood Reporter. April 17, 2014. ^ "Chris Pine Thriller 'The Finest Hours' Pushed to 2016 by Disney". The Wrap. April 8, 2015. ^ "'Wet Hot American Summer': Chris Pine, Kristen Wiig, Jon Hamm & Jason Schwartzman Join Cast". Deadline. January 28, 2015. ^ "Crackle Sets Premiere Dates For 'The Art Of More', 'Supermansion', 'Comedians In Cars…' – TCA". Deadline. August 5, 2015. ^ "'Comancheria' With Chris Pine, Ben Foster & Jeff Bridges Acquired By CBS Films". Deadline. May 4, 2015. ^ "Chris Pine's 'Hell or High Water' to Hit Theaters in August". Variety. May 3, 2016. ^ "Filming Begins on Star Trek 3 at the Squamish Boulders in British Columbia". ComingSoon.net. June 25, 2015. ^ "'Star Trek: Beyond' Gets New Release Date". Variety. September 17, 2015. ^ "OUTSTANDING CHARACTER VOICE-OVER PERFORMANCE - 2016". Television Academy. ^ "Complete list of 2016 Emmy nominations and winners". Los Angeles Times. September 18, 2016. Retrieved October 3, 2016. ^ "BWW Exclusive World Premiere: Watch Barbra Streisand & Chris Pine Take on MY FAIR LADY on Her ENCORE Album!". Broadway World. August 24, 2016. Retrieved August 29, 2016. ^ "Chris Pine Closes Deal to Star Opposite Gal Gadot in 'Wonder Woman' (Exclusive)". The Wrap. July 28, 2015. Retrieved May 3, 2017. ^ "Warner Bros. Pushes 'Jungle Book' to 2018, 'Wonder Woman' Gets New Date". The Hollywood Reporter. April 6, 2016. Retrieved May 3, 2017. ^ "February streaming calendar: 'Santa Clarita Diet,' 'Golden Girls'". USA Today. January 30, 2017. Retrieved February 13, 2017. ^ "'Wet Hot American Summer: Ten Years Later' Trailer & Premiere Date: The Gang's All Here — Again". Deadline. June 22, 2017. Retrieved August 8, 2017. ^ "Natalie Portman, Chris Pine, Ed Helms among guests on Angie Tribeca". Entertainment Weekly. February 9, 2017. Retrieved February 13, 2017. ^ "'Breakthrough': Ana Lily Amirpour on How She Was Lured to Create an Animated Cancer Monster for Nat Geo". Indie Wire. May 2, 2017. Retrieved May 3, 2017. ^ "Chris Pine Joins Ava DuVernay's 'A Wrinkle In Time'". Deadline.com. October 21, 2016. Retrieved July 29, 2017. ^ "Disney Movie Release Schedule Gets a Major Update". ComingSoon.net. April 25, 2017. Retrieved July 29, 2017. ^ "Netflix Lands Outlaw King". Deadline. April 24, 2017. Retrieved August 22, 2017. ^ "Outlaw King | Netflix Official Site". www.netflix.com. Retrieved November 11, 2018. ^ ""OUTLAW KING" STARTS SHOOTING". ECHO ARTISTS. August 21, 2017. Retrieved August 22, 2017. ^ Kroll, Justin (May 5, 2017). "Chris Pine and Michelle Williams to Star in 'All the Old Knives' (EXCLUSIVE)". Variety. Retrieved October 13, 2017. ^ Goldberg, Lesley (July 27, 2017). "Chris Pine Drama From 'Wonder Woman' Director Set at TNT". The Hollywood Reporter. Retrieved July 28, 2017. ^ "Chris Pine Rushes to Uncover Hollywood Mystery in 'I Am the Night' Trailer for TNT". The Hollywood Reporter. July 2, 2018. Retrieved July 4, 2018. ^ "Star Trek 4 Still Being Written". Den of Geek. Retrieved November 12, 2017. ^ Otterson, Joe (September 5, 2017). "Chris Pine to Star in Robert F. Kennedy Limited Series at Hulu". Variety. Retrieved October 13, 2017. ^ "Patty Jenkins on Twitter". Twitter. Retrieved July 2, 2018. ^ Kit, Borys (August 10, 2018). "Chris Pine and Chris Hemsworth 'Star Trek 4' Future In Doubt as Talks Fall Through (Exclusive)". Hollywood Reporter. ^ "Interview Chris Pine". Femalefirst.co.uk. June 16, 2006. Retrieved August 26, 2009. 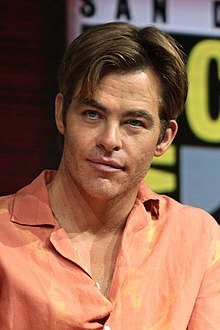 ^ "Chris Pine, Captain Kirk actor, charged with DUI". CBC News. March 14, 2014. Retrieved February 14, 2016. ^ "Chris Pine charged with DUI in New Zealand". Chicago Tribune. March 14, 2014. Retrieved February 14, 2016. 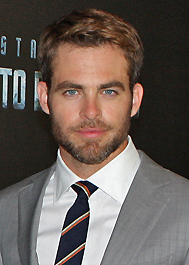 ^ "Star Trek actor Chris Pine faces drink-driving charge in New Zealand". The Guardian. Retrieved March 12, 2014. ^ Dally, Joelle (March 17, 2014). "Film star Chris Pine pleads guilty: Star 'devastated' by conviction". Christchurch, New Zealand: The Press. Retrieved March 17, 2014. ^ "Chris Pine @ Jimmy Kimmel 16.02.12". Vimeo. Retrieved November 12, 2017. ^ "Chris Pine Reveals His Politics Amid High-Risk 'Jack Ryan' Play". The Hollywood Reporter. Retrieved November 12, 2017. ^ "'Star Trek': J.J. Abrams, Chris Pine, and more sign letter against Donald Trump". EW.com. Retrieved November 12, 2017. ^ Bui, Hoai-Tran. "Joss Whedon, Chris Pine imagine if Congress was your coworker from hell". Washington Examiner. Retrieved November 12, 2017. ^ Dessem, Matthew (November 1, 2016). "Chris Pine Is the Worst Co-Worker Ever (and Also a Republican Congressman) in the New Joss Whedon Video". Slate. ISSN 1091-2339. Retrieved November 12, 2017. ^ "The Story Behind the Black-and-White Photo That Linked 'Batman v Superman' and 'Wonder Woman'". Yahoo Entertainment. June 13, 2017. Retrieved December 1, 2017. ^ "Ovation Nominees". Lastagetimes.com. October 20, 2009. ^ "Satellite Awards". International Press Academy. Retrieved February 16, 2016. Wikimedia Commons has media related to Chris Pine.